A government-appointed commission of inquiry has found the top leadership of the Bharatiya Janata Party (BJP) and its Rashtriya Swayamsevak Sangh (RSS) allies and mentors bear responsibility for the 1992 razing of the Babri Masjid, a 14th century mosque, in Ayodhya, which BJP claimed stood at the place where Lord Ram was born long long years ago. On Dec. 6, 1992 right wing Hindu activists mobilized by the BJP, the Shiv Sena (a Maharashtra-based right wing Hindu party), the RSS and allied Hindutvaite organizations stormed the 450-year-old mosque and demolished it using pick axes and other hand implements. In the preceding two years, the then BJP head and the party’s current parliamentary leader L.K. Advani had spearheaded an all-India agitation targeting the Babri Masjid. In the name of securing the “nation’s honour,” the “Ram Janmabhoomi” (Birthplace of Ram) movement demanded the demolition of the Babri Masjid and the erection in its place of a temple to the Hindu God Ram. In the commission’s final 1,000-plus page report, which was tabled in parliament on Tuesday, Justice M.S. Liberhan categorically rejected the claim of BJP and RSS leaders that the razing of the Babri Masjid was a “spontaneous” act. Rather the razing of the Babri Masjid was a conspiracy. A conspiracy “carried out with great painstaking preparation and pre-planning,” organized by the RSS, and aided and abetted by the BJP state government of Uttar Pradesh. Liberhan observed that Babri Masjid was not set upon by a mob run a muck. While security forces—on the order of Kalyan Singh, the BJP Chief Minister of Uttar Pradesh, stood by—a small number of veiled karsevaks (Hindu volunteers) stormed the mosque and quickly produced instruments to both demolish it and erect a makeshift temple. Liberhan finds that the Kalyan Singh’s state government acted in concert with the RSS to subvert the rule of law in the India’s most populous state. “[T]he Chief Minister of the state of Uttar Pradesh, its ministers and its mandarins supported the destruction [of the Babri Masjid] with tacit, open and material support at every step. Kalyan Singh’s government systematically replaced any official or police officer in the twin cities of Ayodyha and Faizabad who were not sympathetic to the Ram Janmabhoomi agitation. 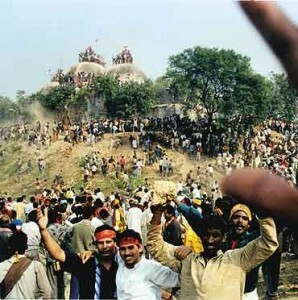 It used the “coercive forces of law” only against those who were opposing the agitation; repeatedly lied to the Supreme Court about its intentions; instructed security forces to do nothing to prevent the storming of the Babri Masjid and let it be known in advance that force would not deployed; ensured that no videotape of the razing (including form the closed-circuit cameras the Supreme Court had ordered placed at the site) survive; and failed to order security forces to intervene when mobs began attacking and killing Muslims. Chief Minster Singh did not direct the police “to use force or resort to firing to chase away the miscreants or to save the lives of those wretched innocents …” And he allowed “the wanton violence against human life and property” to continue “unabated,” refusing, even as the death toll rapidly mounted, to call out the central government para-military forces that had been deployed to the state and that Singh had previously ordered to stand down so as to allow the mosque to be destroyed. As for the national BJP leadership—Advani and Atal Behari Vajpayee ( prime minister from March 1998 through May 2004)—Liberhan calls them “pseudo-moderates.” Both before and after the razing they claimed to deplore violence and said they wanted a “negotiated” settlement to have the Babri Masjid taken down and replaced with a Hindu temple. But in reality they served as accomplices, providing a moderate and benign face for those bent on subverting India’s secular state. Liberhan says that while they were not in charge, the “pseudo-moderates” knew what was being planned and failed to stop it because they are beholden to the RSS and, in any event, hoped to benefit politically from the assertion of Hindutva power. “It cannot be assumed even for a moment,” concludes Liberhan, “that L.K. Advani, A.B. Vajpayee or M.M. Joshji did not know the designs” of the RSS. The BJP, whose formation in 1982 was co-sponsored by the RSS, has always vehemently denied that it is an arm of the RSS. Liberhan was appointed to inquire into the events surrounding the razing of the Babri Masjid ten days after it happened. Seventeen years later, the report while bluntly blaming the Sangh Parivar and the BJP, neatly whitewashes the role of the Congress Party’s central government of the day. The learned judge argues that the constitution tied the hands of Congress Prime Minister Narasimha Rao, but jurists disagree with his contention pointing out that Central government repeatedly invoked Art 356 to send packing provincial governments often on flimsiest of reasons. While Liberhan absolves the Congress government and party of any responsibility, he chastises various Muslim organizations for failing to defend their community or well-serve it in negotiations over the Babri Masjid and dismisses any suggestion that Muslims in India constitute a socially-disadvantaged minority and a frequent target of discrimination.